What Are Mustard Seeds and How Are They Used? There are over 40 different varieties of mustard plants, but three are the most popular for culinary use; black, brown, and white mustard seeds typically go into recipes and making mustard. All three varieties are found in the U.S. as well as other parts of the world. Mustard is the second most-used spice in the United States, as its usage is only exceeded by the peppercorn. And it's no wonder since mustard works well with all types of meats, pork, poultry, and seafood. You may be used to standard yellow prepared mustard, but there are other wonderful varieties of seeds and prepared mustards to experiment with. All parts of the mustard plant are edible, including the seeds, leaves, and flowers; it is in the same genus as cabbage and turnips and is an annual plant. Brassica nigra is the plant that produces black mustard seeds. It is native to North Africa and parts of Europe and Asia; black mustard seeds are still very popular in the Middle East and Asia Minor where they originated. The seeds are removed from their seed coats and are very small. They can be ground into a spice or used whole, often added to hot oil to bring out the flavor. Brown mustard seeds come from the Brassica juncea plant. It is also often called Chinese mustard, Indian mustard, or Oriental mustard. There are different varieties of brown mustard seeds, ranging from those with a dark brown seed coat to others that are dark yellow. Yellow mustard comes from the seeds of the white mustard plant, Sinapis alba. While it is in the Brassicaceae family, it is not as closely related to the other two types of mustard as they are to each other. The white mustard plant bears light tan seeds that are a little larger than brown mustard seeds. These end up as the bright yellow mustard due to the addition of turmeric or dye. Black mustard seeds have been used since ancient times by the Romans and they are thought to be the type of mustard seeds mentioned in the Bible. Black mustard seeds are also likely what gave mustard its name. In medieval France, they were mixed with unfermented grape juice (must) and called mout-ardent (burning must), which transformed into moutarde in French and mustard in English. Brown mustard originated in the Himalayans and has virtually replaced black mustard in American and British kitchens, particularly in North American Chinese restaurants. The white mustard plant originated in the Mediterranean area and can be cultivated in colder climates as well as warmer climates, which may be a factor in its popularity. What Do It Taste Like? Black mustard seeds are the most pungent of the three but are also the least common. Brown mustard seeds are less spicy than black and spicier than white mustard seeds, as can be seen in most types of brown mustard condiments. White mustard seeds are milder than brown or black mustard seeds, but they still contain pungent flavor producers, especially sinalbin. Their heat stays mainly on the tongue rather than traveling up the nose, as it does with brown and black seeds. The heat is also shorter-lived than those varieties. Black mustard seeds are a common ingredient in Indian cooking. They are often kept whole and fried (or toasted) before adding to a dish or including in a stir-fry along with other aromatic ingredients. Brown mustard seeds are used in Europe to produce Dijon mustard and other specialty mustards, and the usual table mustard in Russia is made from brown mustard seeds. In Asian countries, brown mustard seeds are used to produce condiments and mustard oil. This mustard oil can contain toxic erucic acid, so is not imported to the United States. White mustard seeds are ground to make a yellow mustard condiment. They can also be toasted to add to dishes or used for pickling. 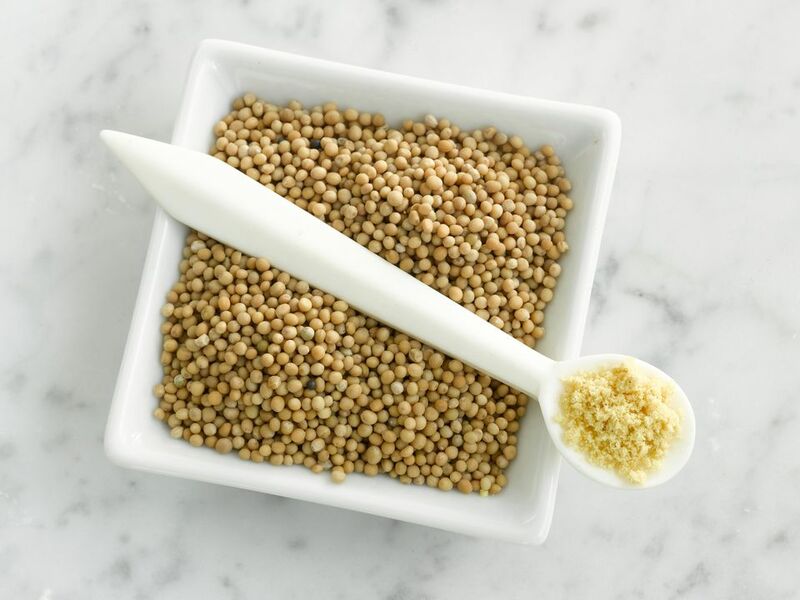 The most common way to incorporate mustard seeds into a recipe is when making mustard. However, there are some dishes, particularly in Indian cuisine, that use the black mustard seeds for spice and texture. The seeds are sauteed in oil until they pop and cooked along with the other ingredients. Brown and white mustard seeds are not only made into mustard but also incorporated into pickling spice. If you shop the spice section of a typical grocery store, you should be able to find yellow mustard seeds from American companies such as McCormick. These are also the mustard seeds in common pickling spice blends. Brown mustard seeds may be found at specialty spice stores such as Penzeys, online, or in Asian specialty stores. Black mustard seeds can often be found at Indian specialty stores. Mustard seeds will keep for up to one year if stored in an air-tight container in a dark, dry place. Since the mustard plant is from the same family as cabbage, Brussels sprouts, and broccoli, the mustard seeds naturally are packed with minerals and are rich in calcium, potassium, magnesium, and phosphorous. Traditional medicine has utilized mustard seeds to relieve cold symptoms, aid in digestion, reduce aches and pains, and lessen respiratory issues.